Jonathan Franzen's Freedom may be getting tons of rave reviews, but whoever designed the covers for both the US and UK editions should get another day job. 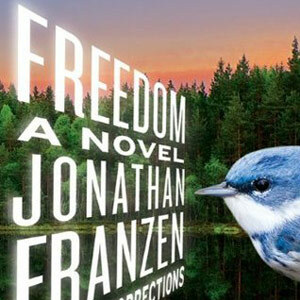 If there were ever a book that deserved less of a crap cover, then it has to be Jonathan Franzen's Freedom. With all the hype surrounding his latest book, one would have thought that the book cover designers would have maybe a put a little more effort coming up with something which is better than the covers pictured above. Let's take a look at the covers, shall we? - Slanted text on covers? Isn't that reserved for just-out-of-high school students who've discovered the wonders of Photoshop for the very first time? - There is a bird on the cover. A very random blue bird that would have made the cover more bearable had it actually not been there. - The black and cream colour combination? Gets an F (just like the cover) for originality. - I wonder if the UK cover designer killed the bird on the US cover because there is a random feather in the bottom right-hand corner of the cover. In which case, they should have at least tried to hide the evidence. Still, I much prefer the stark, clean black and cream cover of the UK edition to the birdie-gone-wrong mess that is the US version. But why don't you tell me what you think? Which cover would you rather choose?